The TCS230 color detector can measure three primary colors Red, Green and Blue and it also has a separate white light detector. Since any color can be created from different levels of these primary colors, the unit can tell you the color composition of a light source. 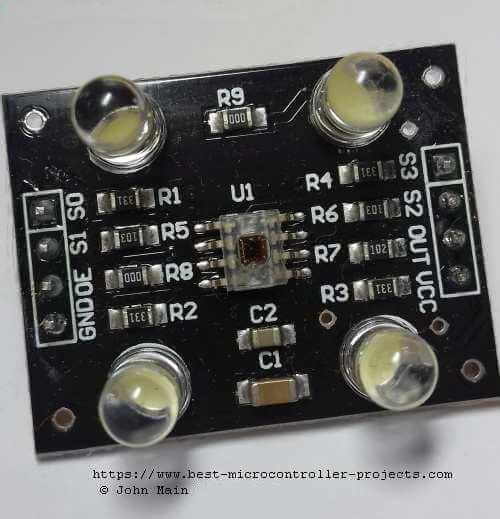 The four LEDs on the breadkout board (show below) are there to illuminate the subject with an even light source making it easier to get a light measurement. Note: Light measurements should be made at about 1~3cm to get a more accurate result. You can use the TCS230 (or newer device TCS3200 see here for differences) where you need to take action based on the color of an object. The device does react to infrared so may need an infrared filter or use the device in an enclosed space. The TSC230 chip mounted on a breakout board. Instead of giving an output for each color the device outputs a single signal which is a square wave. The frequency of the square wave is proportional to the amount of light falling on a set of light detecting diodes. Since there are four different sources of information red, green, blue and clear photodiodes you would expect four outputs. 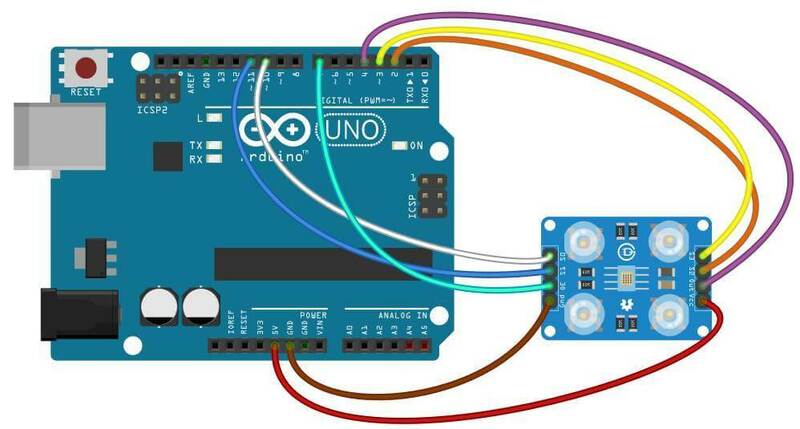 Instead you control which set of diodes is connected to the output using two digital control inputs. So only one set of photodiodes is connected at a time to generate the output. In the photo below you can see the individual red, blue, green and clear filters. It's a bit blurry - but that was a very difficult photo to get and remember each section is 120um square so each one is about the width of a hair (17-181um) [Brian ley]! 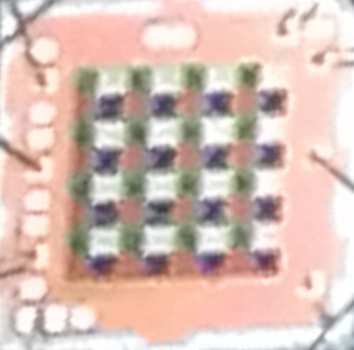 Zoomed in filters of the TCS230 from image above. 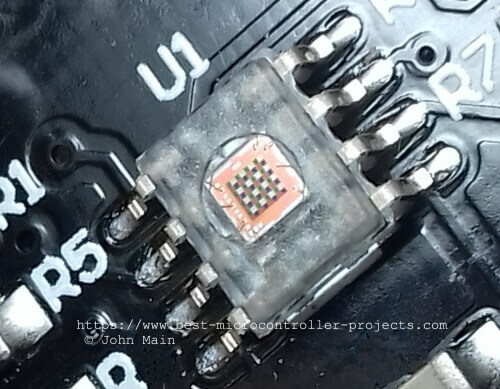 In fact several photodiodes for each color are connected in parallel and these are spread evenly over the sensor surface, as you can see in the photo above. This layout obtains an overall reading for each color not just from an individual photodiode. For the TCS230 there are a total of 64 photodiodes. 16 have a red filter above them, 16 have a green filter, 16 have a blue filter and 16 have a clear filter. Note: There is also an output enable that tristates the output when high (OEn). This would allow you to attach several different TCS230 chips to detect colors from different parts of a machine using only one input. When using only one device set it low. The signal output by the TCS230 is obtained by a current to frequency converter that takes as its input the average current from the selected set of photodiodes. The idea is that you switch one set on, take a reading and then switch to the next set until all four measurements are done. The output signal is a square wave with even mark to space ratio: 50%high, 50%low. The square wave output by the device can also be divided down and this allows slower processors to to make measurements more easily. There is no measurement penalty as the divided down output is simply an average of the original. The only disadvantage is that because the signal is of a lower frequency you can not make measurements as quickly. If it was important to make a light reading very fast then you would want to use a high speed processor and not divide down the output signal. You can imagine that this might become important in an industrial process measurement e.g. for measuring the state of a product e.g. you would want to quickly measure the color of an item on a conveyor belt and reject it if it as the wrong color. The maximum full scale frequency output from the TCS230 are shown below for the scaling factors controlled by S0 and S1. Scaling is really just using an internal clock chip that counts the input signal (the primary clock output from the photodiode current to frequency converter) and generates divided down clocks. Note: For the TCS230, TCS3200 and TCS3210 the above parameters are identical. Note: Typical values are shown above. From the above table you can see that the TCS3200 and TCS3210 have been optimized for low power operation (in power down mode) and also for operation below 0°C. On an Arduino the easiest way to use the TCS230 is to use the pulseIn() function, first setting the dividers to output the lowest frequency. None used: Just use the function pulseIn. The RGB array holds the color values to be found while the colname array holds the text you want to display for the corresponding RBG value. Warning: When you first use the code, the colors will NOT be detected correctly since your lighting setup and detection objects will be different to mine. Follow the calibration process below. The sensor is very sensitive to any changes in light and in practice that means any slight distance changes from the sensor to the object will cause a different reading. Additionally any ambient light changes will also cause a different reading. To calibrate the sensor, push the sensor down onto colored paper as even a small adjustment fails since the sensor is extremely sensitive. Set the serial monitor to 115200 Baud and push the sensor down and hit the 'Enter' key in the serial monitor input field. This will then show you the current RGB values. Copy these values into the RBG array and set the equivalent colname text. Recompile (or add some different colored objects). Recompile and check that the 'color' is found. Now you can test the 'objects' with the code now reporting the color of the object. As for "real" calibration- Its difficult and the only way you will achieve it is to place the sensor in a closed environment where you can control the lighting levels - this will give repeatable reliable measurements. Click in the code below to copy it to the clipboard. // Detect colors using TCS230. #define variance 50  // Acceptable detection error 2%. // int RGB[NUMCOL]; // Five colors with 3 elements. // Array of NUMCOL strings len 10. 11 for null. // Typical values for 2% dividers (set variance to 50). val = pulseIn(TCS320_OUT,HIGH,20000); // 2000us=2ms  2Hz min. // Compare a value to a value and variance. chr = Serial.read(); // Consume. Why does the code use 2 percent dividers? You can choose to use raw 100%, 20% or 2% output and most other code examples use 20%. The function used to measure the output of the chip is pulseIn, which is accurate to 4us, so to get maximum accuracy we need an output that is big enough compared to the accuracy of pulseIn. The following data is taken from my setup which is probably an average lighting setup in an office. These are provided to show the typical minimum and maximum periods in microseconds that are available for measurement using the pulseIn function. What effect does changing the divider output from the TCS230 have on the output periods to be measured? How does changing the dividers affect the output periods? 1.0/1199e-6 = 834Hz to 1.0/188e-6 = 5319Hz (5.3kHz). (max is 12kHz - T=83us). 1.0/119e-6 = 8403Hz to 1.0/18e-6 = 55555Hz (55kHz). (max is 120kHz - T=8.3us). The quoted max frequency is 600kHz - not measured. The period will be 1.6us. For the 20% dividers you are getting close to the measurement capability of pulseIn which is 4us i.e the minimum period measured was 18us and that is only -5 counts of pulseIn data. So that measurement is getting close to being too small and therefore less accurate i.e. the difference between colors will need to be larger to register a difference in the chip output = less sensitive. The resolution here is 22% of the minimum period which is fairly bad. The periods for 100% output will be even smaller (1.0/600e3 = 1.6us) and that would not be measurable using an Arduino Atmega328p microcontroller . When the 2% dividers are used the program can make the most accurate period measurement since the periods output by the chip are long compared to the pulseIn accuracy of 4us. i.e the lowest period measured was 188us for these dividers ( ~48 periods of 4us ) compared to 18us ( ~5 periods of 4us ) for the 20% dividers. The resolution here is 2.13% of the minimum period which is quite good. Therefore the 2% divider output is the better option for measurement accuracy. Warning: The light detector is extremely sensitive so although you can get maximum accuracy the periods measured will change a lot depending on the lighting conditions and object distance. That is why the variable 'variance' allows you to specify an error value around each RBG center point for reliable color detection. The spectral response of the photodiodes is interesting in that all the photodiodes react to infrared light (periods above 700nm). When you add in the green and blue filters, each response shows two peaks one in the visible spectrum and one in the infrared spectrum. So when you use the TCS230 or TCS3200 (same photodiodes) for measuring red, green, blue or white light you will be actually gathering an infrared response as well. So this is definitely not the same response as your eye's response to light. The question is: Does that really matter? ...and the answer is: It depends! If your project is trying to measure a response that is as close as possible to a human eye response then yes it does matter. If on the other hand, the project is sorting items based on color, and is used in a well defined environment, (not changing between florescent and incandescent bulbs) then no, it does not matter. As long as the detector is enclosed in a defined environment then it will always operate the same way i.e. within a machine closed in, with its own LED light source; The output of the detector will generate the same measurement results (however, consider aeging and temperature effects). Note:The TCS230/3200 detector is extremely sensitive so even changing the distance of the object to the sensor will change the measured colors -depending on ambient light conditions - so removing infrared detection may not solve detection problems anyway. In the data sheet for the TCS230 there are two spectral diagrams: copied below . 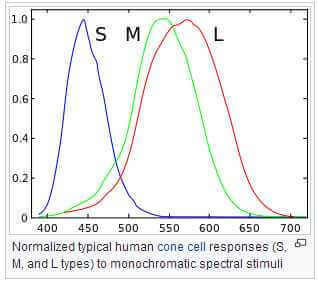 In addition I have added the color spectrum chart from wikipedia that shows a human eye response. It is important to note that the color detection of the photodiodes themselves is affected by infrared and to get a better result that is not affected by infrared you have to use an infrared filter. This is the response of the TCS230 with no infrared filter on the left and with an infrared filter on the right. On the left you can see that the Green response has two peaks (~550nm and ~830nm) , the Blue response has two peaks (~470nm and ~800nm) and the Red response goes from 600nm to 1100nm. The maximum response you really want is from 450nm to 700nm, since the 700nm wavelength is the maximum your eye can detect . This means any infrared radiation that your eye can not see will affect Red, Green and Blue readings unless an IR filter is used. 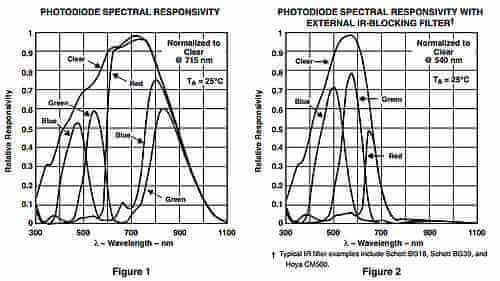 When you use an IR filter(right hand diagram above) the filter smoothly chops out wavelengths above 700nm and there is only one peak response per type of photodiode. The response is far more similar to the human eye response shown below. The only trouble with those Hoya or Schott filters is tha they cost a lot more than the sensor itself; You can find a cheap IR filter on ebay by searching for X2 ir-cut CS lens mount. The best way to get a more accurate color detection, that more closely matches the human eye response, is to use an infrared filter in front of the the sensor. Note that this also applies to the TSC3200 and TCS3210 as these also employ similar photodiodes that have similar response curves. However you can still use the devices without an IR filter and will still get color results as long as the lighting conditions and distance from the object are kept constant.